Every woman who has ever experienced painful menstrual cramps knows the importance of pain relief. For some women cramps can be mild while others experience debilitating pain that can affect their ability to work, attend school, and participate in athletics or social activities. Dysmenorrhea—the medical term for painful periods–seriously affects 60% of women and their quality of life. According to research from 2013, American women miss about 600 million work hours annually due to this painful condition. But researchers found that an herbal extract that in some instances may be more effective than ibuprofen—Advil or Motrin. The study published in the Iranian Journal of Nursing and Midwifery Research assessed the effectiveness of an herbal extract of fennel seeds, which also contained vitamin E, in comparison to ibuprofen. Sixty-eight women with an average age of 21.8 were divided into two groups: 34 received the fennel extract and vitamin E while the other 34 received ibuprofen to treat their menstrual pain. After administering the remedies, the women were assessed for pain levels one, two, three, six, and forty-eight hours later. While both the fennel extract and ibuprofen showed effectiveness against the pain, the fennel extract and vitamin E demonstrated a statistically significant greater effectiveness during the first and second hours. Ibuprofen is known as a non-steroidal anti-inflammatory drug (NSAID) and is frequently used to treat menstrual cramps but may be contraindicated in people with gastrointestinal ulcers or sensitivity to aspirin. Some of the side effects of the drug include: nausea, dyspepsia, diarrhea, and fatigue. 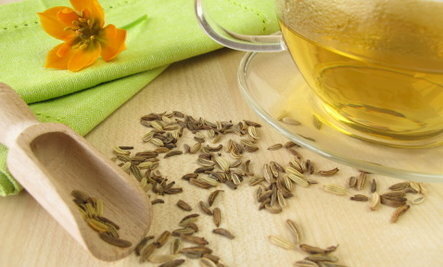 Conversely, fennel is a long-standing herb with a history of use in the treatment of digestive complaints. The seeds and the extract of the seeds have science-proven abilities to improve digestion, reduce symptoms linked to menstruation, and act an anti-spasmodic. The scientists who conducted this study on menstrual cramps believe its analgesic effect may be largely due to fennel’s anethole content, since this ingredient is best known for its anti-spasmodic actions. Additionally, other studies show that anethole joins to the body’s dopamine receptors to decrease pain. Dopamine is a feel-good brain hormone that aids communication between the body and the brain. The study did not indicate a specific product or dosage used to achieve these results. Fennel (Foeniculum vulgare) seed extracts are widely available from your local herbalist or health food store. A typical dosage is 1 to 2 mL three times a day. Follow the herbalist’s or package directions for use. Alternatively, you can also make fennel seed tea by pouring 1 cup of boiling water over 1 to 2 teaspoons of slightly crushed fennel seeds and let infuse for at least ten minutes. Drink one cup three times daily. As always, talk to your doctor before making changes to your health regimen.